Different people use different measurements to evaluate their day. A salesman may land a big account and call it his best day. An athlete may break a record in his sport and call it his best day. A woman may marry the man of her dreams and call it her best day. As a child of God, however, today is your best day because you are in Christ. You may be a salesman who landed a big account today, or you may have made no sale at all. 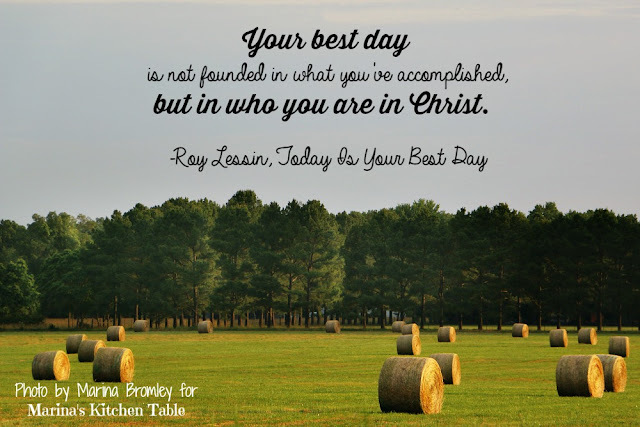 Your best day is not founded in what you've accomplished, but in who you are in Christ. Being in Christ means that He is the atmosphere in which you live your day. I was recently in a large conference room for a staff meeting. Because I was in the room, the atmosphere of the room had an influence upon me. The room had padded chairs to sit upon. The lighting in the room was soft and inviting. The colors on the walls were pleasing to the eye. Best of all, the room was air-conditioned, making everyone inside feel comfortable, even though it was hot outside. Because you are in Christ, everything that is true about Christ will have an impact upon you. It is in Him that you live and move and have your being. As you go through this day, consider all that is yours because you are in Christ. You stand before God with your past forgiven and forgotten. Your life is under His ownership and watch-care. You have been brought into union and fellowship with God. You have no cloud of condemnation hanging over your head. You are no longer a slave to the sins that once had you bound. You are covered by the love of God from every direction. You are God's child and a part of God's family of believers. You have been set apart for God's special purpose. You can see life with a heavenly point of view. You are in God's strong hands. You travel on paths of victory as you walk with your hand in His. You have a new calling, a new purpose, and a new direction. You overflow with spiritual blessings. You live under and in the authority of Jesus. You are showered with grace and kindness. You are God's masterpiece in the making. You have a relationship with Jesus that will never end. You can go through this day clothed with the righteousness of Christ.